The Rebel's Renaissance! 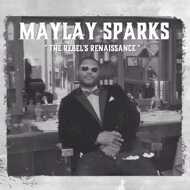 The 5th installment from Philadelphia's man on the mic "Maylay Sparks". Just as the many treasured projects before, and exclusive works with hip hop's elite, The Rebel's Renaissance is consistent with the golden era sound, to combine strong intense lyrical content over flowing sampled melodies & world class turntable techniques. This new Album boast crisp production from the the likes of Koolade, producer of Masta Ace's hip hop anthem " Beautiful / Long Hot Summer LP ", and the new smash EP "The Makings", with Daimond D and Sadat X. On the Last Emperor & Rucker PAWK featured track "Illadelph Elohim" Koolade provides a heavy drum laced beat with percission cuts from Elite Fleet DJ Devastate. Urban click the Slovenian production crew who teamed up with Maylay Sparks in 2011 for the "Truckdriver Fortuneteller EP", provide the opening tracks "Sleepless", "Another Bottle" featuring DJ White Shadow of Norway, and allstar feature track, "Protocol" with Rasco of Cali Agents and El Da Sensei from Artifacts. DJ Connect continues to hold the bar with production on the Follow up single "In The Green" with drinking buddy Chukk Rukkuz, the nostalgic "Purple Fox" and "Illustrated Rhyme Flow". K Sluggah from Muddy Fatique lends a hand on "Lifshitz" the LoLife inspired tune with an appearance from his number one doobie brother & patner in rhyme Rocc Spotz who has appeared on many of Maylay's past Albums and tours. RuzBeats from the squad provides an extra funk groove heavy protect ya neck ode to Malmö track "Changing Scenery" for his debut. Sure to be a favorite amongst hip hop fans young and old Rahsheed aka Maylay Sparks exemplifies what true lyrical artistry and the love for the four (4) elements can bring to the table everytime.